I want to take a minute to thank all of the veterans and others out there that have served to keep this country as amazing as it is! Without you, we wouldn't be able to enjoy some of the necessities of life or quite possibly even our hobbies! Thank you all for your service to us and this great country. Invasion Earth has only been out a couple days as of now and everyone has already started brewing up new ideas for the Winter Championship and their local Duel Day scene. It's pretty obvious that with an increased card pool of 90 cards (and [ccProd]Vicious Squillace Scourge[/ccProd] ), the meta will begin to change. Some of these changes may happen slowly as players start to see what cards actually work well in the new environment versus those that just fail. However there are some others that will almost immediately jump out, like the Corrupted archetype. This deck type raises quite a bit of hype in itself and for good reasons. But what cards in the set really offer the best strategies or the best overall advantage when you play them? What cards were hyped and will end up just falling by the wayside? Let's get started by taking a look at my 6th-10th picks for the top ten cards in the Invasion Earth set. The Hype: They brought out this card so they could ban [ccProd]Bottle of Wishes[/ccProd]! It does present a very unique ability stacked up on a Level 7 creature with Double Breaker that is very reminiscent of our recently banned bottle brethren. Essentially after milling the top three cards from your deck, you get to shuffle up your discard pile and randomly select a card from it. 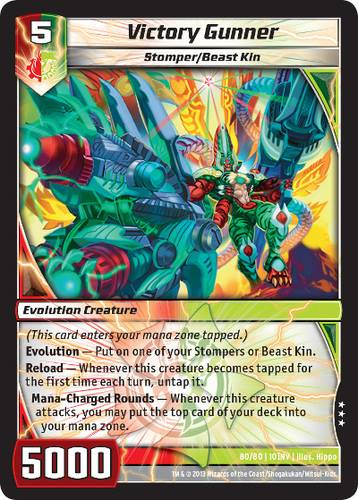 If it's a non-e volution creature you can put it right into the battle zone for free, no strings attached... unless you summon a [ccProd]Razorkinder Puppet[/ccProd]t of course! Any other card you reveal from your discard pile simply returns to your hand, so no matter what you will gain advantage off of playing this card. So what's this card's potential in the upcoming meta? Well, let's just say that you can bring out a mediocre card or you could bring out a powerhouse cards like [ccProd]Queen Kalima[/ccProd] or [ccProd]Eternal Haven[/ccProd]! The Hope: This card will allow Darkness players to utilize their discard pile even further. Ideally I'd like to see this card hit the board and provide me with an extra body, preferably something just as powerful as Megaria, but I won't turn down a free Monarch or Dragon should it come up. This card is far more balanced than [ccProd]Bottle of Wishes[/ccProd], but offers that fun "variance" that everyone kept talking about for the past several months. With Megaria being a Level 7, it allows your opponent more of a chance to come back from a potentially devastating play with Megaria. I myself have legitimately brought out [ccProd]Queen Kalima[/ccProd] with Megaria, but at least my opponent is at the point in the game where they can cast [ccProd]Terror Pit [/ccProd]or other various removal spells. The Hype: All of my Corrupted creatures are going to be free to play! [ccProd]Warbringer Poseidon[/ccProd] introduced a mechanic very similar to the Fire Bird's "Dragonsong" ability, but to corrupted creatures instead. Wizards of the Coast took it a step further though and made it so it cost 2 less mana to play any Corrupted creature. To make matters worse, this card is the perfect incarnation of[ccProd] Finbarr's Dreadnought[/ccProd]'s ability to save your other creatures, but with this card, it even works on itself! So not only are you able to continuously play this 7000 power Double Breaking card over and over again, but you gain the same benefit for all of your other Corrupted creatures as well! Since most of them are lower levels, you can essentially flood the battle zone with them and go to town without concern for their safety. If left unchecked this strategy will easily overwhelm the board making it nearly impossible to make a comeback. The Hope: This card will allow players to be able to effectively run a more controlling version of the Corrupted deck type. Sprout and Reap and Sow will be some of the go to cards to get to that turn seven play to allow them to make for an incredibly difficult board state to deal with. You'll need to resort to using cards like [ccProd]Root Trap [/ccProd] and [ccProd]Tendril Grasp [/ccProd] to even put a dent in the deck. Even if a Corrupted player chose to go a different route, they still have access to other mana ramping options with [ccProd]Bronze-Arm Renegade [/ccProd]or [ccProd]Bad Apple[/ccProd]. The Hype: [ccProd]Major Ao [/ccProd]is a Fast Attacking, Revenge Killing, Skyforce Champion, Blocking Machine! Ao can simply wreck the aggressive match-up's day as long as you can make it to your turn five. Much like [ccProd]Gilaflame the Assaulter[/ccProd], this card can punch a creature in the face and if it wins that battle, you can untap it, leaving you free to attack again or block during your opponent's turn! This card will also fend off against the Corrupted forces with ease, since most of their power levels are under 3000. For those of you who were involved, this seems fitting after the whole "Duel Masters VS The Choten" fiasco in the Kaijudo Dojo Facebook page. The Hope: This card will allow for Skyforce Champion players out there to make another addition to their decks and give it a shot at being semi-competitive. It also opens up the door for a Fire/Light rush deck to run a Blocker just at the end of their mana curve. It's convenient that this card can serve more of a purpose than just the monotonous daily blocking routine. If this card is combined with tap spells and abilities, it can allow you to have spot removal for creatures with less power than Ao while allowing you to go in for another strike or sit back and prepare for the upcoming turns; it's really up to you. The Hype: Napalmeon is going to break the Dragon mirror match! When I first previewed this card on Pojo.com, I was a little underwhelmed right up until the tail end of the card. Where it blatantly states that all of your opponent's Dragon's cannot attack. Much like Keeper of Laws was designed to shake up the control mirror match, it did something counterproductive; it made it stronger. In this situation we have Dragon players obviously wanting to play bigger Dragons, so why not include one that adds power to attacks and provides an additional shield break? At the same time it will stall out the mirror match until one of the players finds some kind of removal spell to deal with Napalmeon. The Hope: This card may find it's way into other decks outside of Dragons. 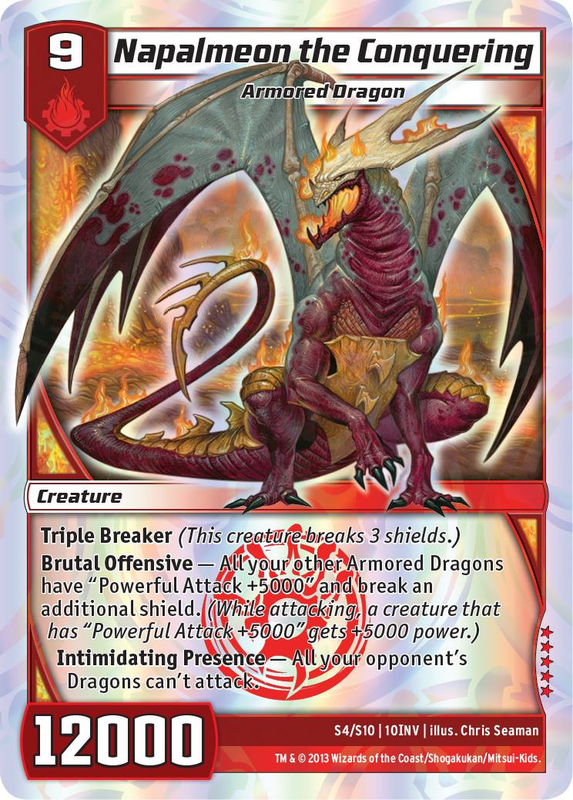 It's obvious that Dragon players will be running this card, but outside of spamming the field with a bunch of birds or getting a hit in with [ccProd]Herald of Infernus[/ccProd], there isn't going to be a quick way to get this card out. It would be ideal tech when playing against Dragon players, however, costing nine mana is a bit high for a piece of tech designed to fight off just one deck type. With the release of this card, we may even see more Dragon players go back to using "Greed Dragons" so they have access to removal such as [ccProd]Root Trap[/ccProd] and [ccProd]Terror Pit[/ccProd]. The Hype: [ccProd]Victory Gunner [/ccProd]is going to make Saber-Bolt a Tier 1 deck again! This card will get a lot of people interested in using the deck again. [ccProd]Victory Gunner[/ccProd] allows for aggressive plays that generate you advantage in the form of mana ramp as well as being able to break up to two of your opponent's shields. With[ccProd] Bottle of Wishes [/ccProd]gone, there's less to worry about when attacking shields; evolution creatures may be making a comeback. The Hope: New deck strategies will emerge. 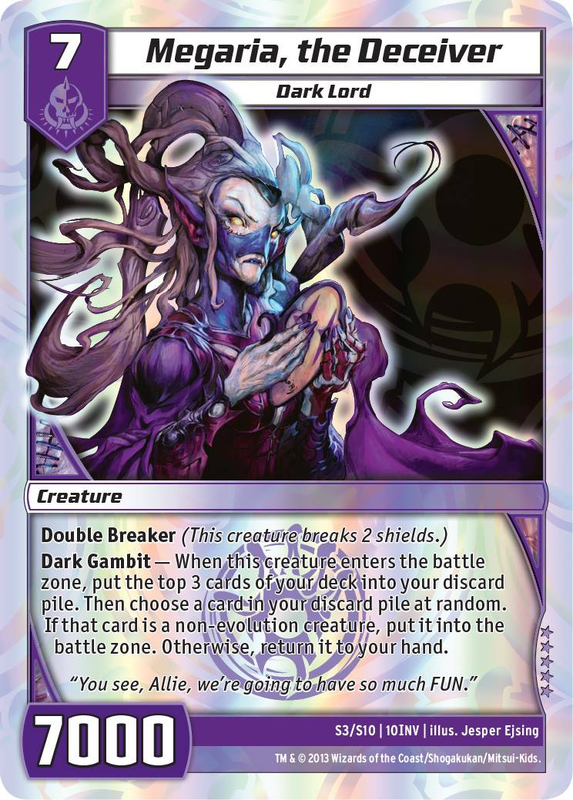 Gunner is a great card in itself but what makes it any better than say[ccProd] Bronze-Arm Sabertooth[/ccProd]? Some of it comes down to preference and some of it comes down to the versatility of Gunner. Sabertooth only nets you mana when he gets banished, where as Gunner can potentially ramp you two mana each turn while picking off creatures or shields. So Beast Kin may just be getting the resurgence they needed to fight off Corrupted creatures, Dragons, and more! But why stop there? Stompers have been gaining more support lately as well. Being able to evolve on multiple targets just increases the playability of this set of evolution creatures from Invasion Earth. There are a lot of cards in this set that could easily make the list, but who's to say they haven't just yet? There's still another five to go after all! Stay tuned next week when I continue the countdown my top ten countdown! Remember everyone that The Circuit Series comes to Worcester, MA on November 17! Don't miss out on your opportunity to meet some amazing players, earn some awesome prizes, get recognized by the community, and have an overall great time! Until next time, this has been Mark Woodin, and as always, remember to keep calm and game on; see you all at the Winter Championships in Texas!